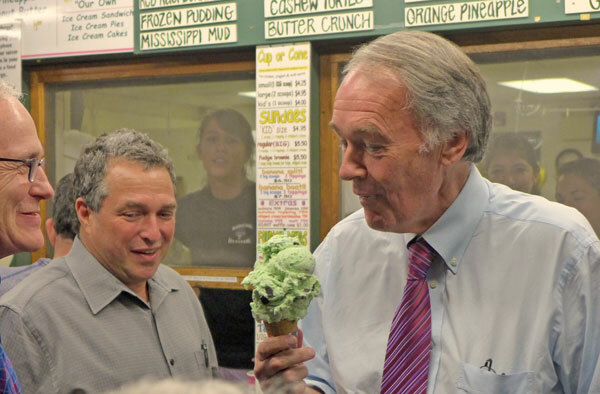 Sen. Ed Markey (right) denies that the national debt is a problem. In 2010, then-Chairman of the Joint Chiefs of Staff Adm. Michael Mullen called the national debt "[t]he most significant threat to our national security." The logic behind such a profound statement was that as the national debt grows, economic growth will slow down and leave the military fewer resources to fight threats. "That's why it's so important that the economy move in the right direction," Mullen said, "because the strength and the support and the resources that our military uses are directly related to the health of our economy over time." Markey, though, disagrees. During Thursday's hearing, the Massachusetts Democrat insisted that the national debt is not a national security threat. "A realistic discussion about it, and accepting expert opinion that this debt that we have is not actually right now a threat to our country, is I think a more realistic and honorable way of talking to the American people about it," Markey said. Markey is, of course, very wrong. The national debt should be a major cause of concern for members of Congress and their constituents. In a January report, the Congressional Budget Office projects that the budget deficit will rise in 2016 and reach $1 trillion in 2022. By 2026, it will surpass $1.3 trillion. Debt held by the public will hit 86 percent. Unless Congress gets a handle on the situation, the bigger picture is even more depressing. "Three decades from now, for instance, debt held by the public is projected to equal 155 percent of GDP," the CBO report explained, "a higher percentage than any previously recorded in the United States." David Wessel of the Brookings Institution, hardly a beacon of free market and conservative thought, believes that the United States faces worrying challenges with the national debt. In a recent piece at the Wall Street Journal, Wessel wrote, "[T]he trajectory of the debt is worrisome for one inescapable reason: When you owe a lot of money and interest rates rise, your interest tab mounts." The national debt is not the only measure that shows Americans that there is a problem. Mandatory spending -- including entitlements, which are the biggest contributor to budget deficits -- will consume more of the federal budget, leaving less money for other important items in the budget, including national defense and security. The CBO, in its extended baseline, projections that mandatory spending as a share of gross domestic product (GDP) will grow from 13.3 percent of the economy in 2016, or $2.46 trillion, to 14.5 percent in 2026, or $4.14 trillion. Over the same period, interest on the national debt will rise from $255 billion to $830 billion. Entitlement spending, such as Medicare and Social Security, is a serious problem, one that Markey ignores. The unfunded liabilities entitlements represent, that is, benefits expected to be paid out minus dedicated revenue collected, is up for debate, but estimates range between $87 trillion and $222 trillion. Some would say that raising taxes is the fix. Of course, whenever taxes are increases, productivity declines and economic growth is put in jeopardy. Doing nothing is not an option because, as the national debt grows, investors will grow less confident in the United States' economy without a higher return on their investment. Despite what Markey may say, the national debt is a serious issue and a threat to our security, and it is disingenuous to deny it.